Gaming technology platform and services provider Nektan is expanding its in-house casino games offering after partnering with development studio ReelFeel Gaming. 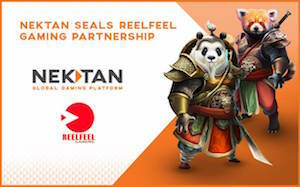 As part of the agreement, ReelFeel Gaming will design and create 10 new Nektan-branded HTML5 games, to be rolled out across the company’s E-Lite and Evolve platforms throughout 2019. Utilising ReelFeel Gaming’s track record for designing and developing dynamic gaming experiences, Nektan’s network of commercial operators and white-label casinos will soon have access to a greater variety of games including a mix of mechanics and themes.